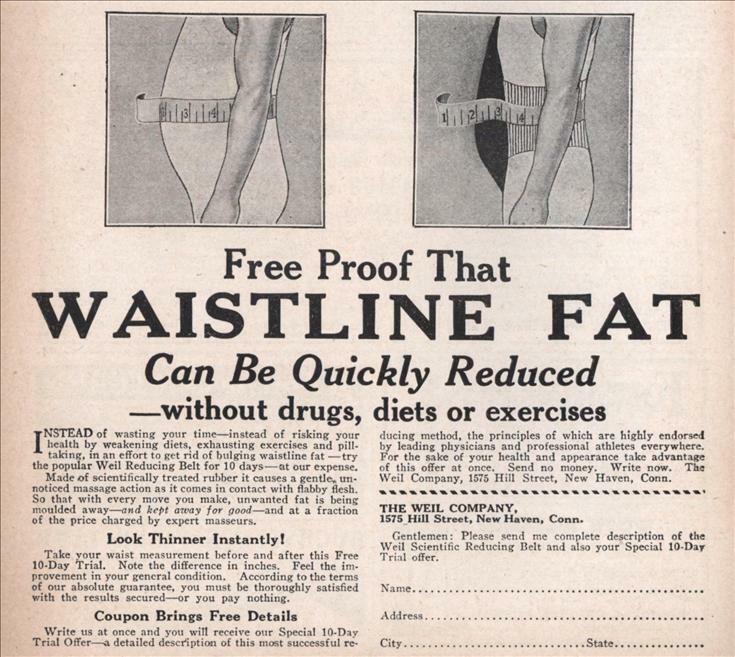 INSTEAD of wasting your time—instead of risking your health by weakening diets, exhausting exercises and pill-taking, in an effort to get rid of bulging waistline fat —try the popular Weil Reducing Belt for 10 days—at our expense. Made of scientifically treated rubber it causes a gentle, unnoticed massage action as it comes in contact with flabby flesh. So that with every move you make, unwanted fat is being moulded away—and kept away for good—and at a fraction of the price charged by expert masseurs. Take your waist measurement before and after this Free 10-Day Trial. Note the difference in inches. Feel the improvement in your general condition. According to the terms of our absolute guarantee, you must be thoroughly satisfied with the results secured—or you pay nothing. Write us at once and you will receive our Special 10-Day Trial Offer—a detailed description of this most successful re- ducing method, the principles of which are highly endorsed by leading physicians and professional athletes everywhere. For the sake of your health and appearance take advantage of this offer at once. Send no money. Write now. The Weil Company, 1575 Hill Street, New Haven, Conn.
Don’t diet or exercise, get a man girdle tubby.